Microsoft’s $900 million dollar write-off, taken due to unsold Surface RT inventory in their Q4 2013 quarterly results, generated quite a bit of noise about the product’s success (or lack thereof). As of early this summer, it was estimated that Microsoft had lost around $1.7 billion in total on the Surface program, not accounting for costs such as advertising. Certainly, writing off $900 million in unsold inventory is painful, representing at the very least a significant miscalculation of supply versus demand. The Surface line is an aggressive move by Microsoft, representing not only their first foray into PC hardware but also the creation of a rather bold new product in a category (tablet-notebook hybrids) that is itself unproven. It wouldn’t be particularly surprising if Microsoft’s initial sales projections were a bit off the mark. 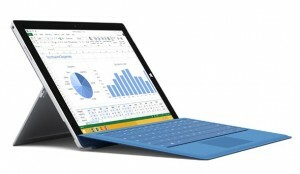 Microsoft’s recent announcement that demand has outstripped supply of the Surface Pro 3 is therefore very good news. One can always debate, quite legitimately, whether such shortages are the result of very high sales or very low shipments. At the very least, though, this news demonstrates that Microsoft learned its lesson and avoided producing too much inventory of the Surface Pro 3. Thank you for your incredible response to Surface Pro 3. After a strong US launch in June, we introduced Surface Pro 3 to 25 new markets just a few weeks ago. Along the way, we’ve been humbled by your response. We’re inspired by the stories we’re hearing from students and teachers, artists, architects, and so many more of you. Due to the response, Surface Pro 3 is in limited supply in some markets. Given the interest that we saw as part of our US launch, retailers ordered what we thought was a healthy amount of Surface Pro 3s for these new markets. It turns out that we didn’t ship enough. At some retailers in Australia, Surface sold out by lunchtime on launch day. In China, retailers are sold out of the Core™ i5 and i7 models. And devices are hard to come by in Germany, New Zealand, Korea, and at one of the largest retailers in the United Kingdom. Personally, I’m excited by this development. As a huge Surface Pro 3 fan, I want Microsoft to succeed here. They’re making truly innovative, well-built, and exciting products, and those efforts are far better served by news reports about product shortages than about write-offs for unsold inventory. If I had to guess, I’d say that the Surface Pro 3 is selling at a healthy but not record-breaking pace, and that it’s at least successful enough for Microsoft to see break-even on the Surface line sometime in the conceivable future. As a sort of reference platform, this is great news–it means that Microsoft can continue to make groundbreaking products that demonstrate the power of the Windows platform without worrying about explaining away billion dollar losses.